Hurricanes. Droughts. Forest fires. Melting glaciers. Man made or acts of God? There are two types of climate change deniers. The first, motivated by commercial or ideological reasons, is a mentality that ignores scientific evidence about global warming and the role of human behavior in creating it. The second is unintentional; the result of simply not wanting to think about such an "inconvenient truth." This kind of denial is cousin to the conscious practice of deliberately taking periodic news fasts in order to avoid emotional stress. These folks do not deny the truth about global warming but they're not truly engaged in the debate. They're doing their best, thank you, when this means recycling their solid waste and limiting the number of vehicles the family drives. And that's most of us. Now veteran environmental journalist, Mark Schapiro has written a book to dilute our innocence and dismantle our complacency. Read Carbon Shock and your sensitivity to global warming will be cranked up to code red, the same color as the book's jacket. Carbon is shorthand for greenhouse gases, the same five that trap heat in the earth's lower atmosphere, generating what we know as the greenhouse effect. Carbon dioxide is only the most abundant. OK. So far, nothing new. But Schapiro connects the dots between the greenhouse gases and just about everything else in our lives that pertains to our private and public economies. We learn about the expensive carbon footprint of airplane travel. We learn about the real costs of food growing and food distribution. We learn about water shortage and why some observers think it is fast becoming the world's more important international issue. We hear how the taxpayer foots the bills for farmers' crop and flood insurance. Real Costs? How many of us are fully aware of these? "It's not that carbon hasn't always had a cost," Schapiro writes, "it's just that, until now, carbon's costs have been, for the most part, invisible. We haven't been accounting for them. Just as an optical illusion tricks the eye into seeing something that's not there, traditional accounting diverts our attention from invisible costs; we see only profits." 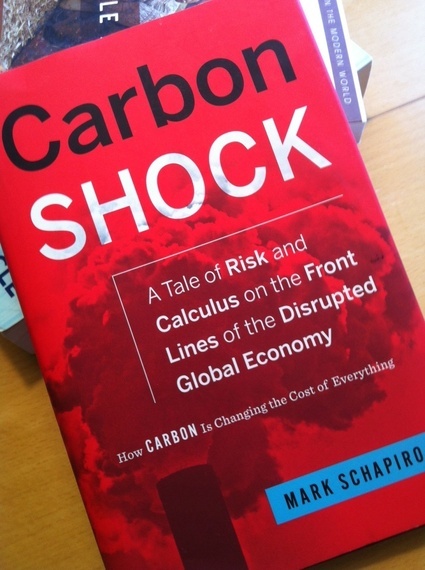 Schapiro's message is that climate change is a shock to the global economic order. He takes us on a detective's journey and along the way, conveniently does the math for us. He demonstrates the external costs of global warming and shows us how identifying the actual costs and consequences gives us the information we need to plan alternatives; to save ourselves and our planet. The book's sub-titles establish its premise: A Tale of Risk and Calculus on the Front Lines of the Disrupted Global Economy and How Carbon Is Changing the Cost of Everything. The book is dense with information and there are hundreds of takeaways. The over-arching message is crystal clear: Climate change links our economic future with our environmental future. •	Establishing a price to pollute compels companies that rely on fossil fuels to acknowledge that they have, until now, been receiving a secret subsidy (my emphasis) in the form of environmental costs that they do not have to count. The airline industry is a prime example. Food and processed food production is another because it has greenhouse gas consequences at every stage of the food distribution system: cultivation, storage, transport and distribution. Our agricultural system has one of the largest carbon footprints of any single industry. Nitrous oxide, a by-product of nitrogen-based fertilizers, is "twenty-three times more potent a greenhouse gas than CO2". Methane is released through the waste of cattle. •	Trees. They are our partners - "the lungs of the earth" - crucial to that life-giving oxygen-CO2 respiratory exchange. Yet deforestation is rampant with immense consequences to our ecological equilibrium. By itself, deforestation accounts for 15 to 20 percent of all greenhouse gas emissions. Why are the trees cut down? To raise food and graze cattle. Citizens of the EU and the U.S. together account for more than 50 percent of the consumption of global crop and livestock production based on deforested land. •	Transportation is the second most significant contributor to greenhouse gases in the United States. Gasoline should be a lot more expensive than the "expensive" gasoline we've been paying for. As an ex-pat living in Europe, I know this is true because it costs me the equivalent of $110 in Denmark to fill up the tank of our car. •	Subsidies to oil companies. Oil spills are a disaster but how many of us realize that taxpayers are paying for the damages? Schapiro describes the 2002 accident of the Prestige, an eight-hundred-foot-long single hull oil tanker that was smashed in a storm, losing seventy-nine million gallons of crude oil on the Galician coast of Spain. The cleanup of the beaches and compensation to the fishermen cost five billion dollars. Who paid? EU and Spanish citizens. The owner's insurance policy contributed less than 1 percent of the total. Eight years later, BP's Deepwater Horizon oil derrick exploded in the Gulf of Mexico. "This time," Schapiro writes, "it was as if the entire maritime system was conspiring to ensure that neither BP nor anyone else would have to assume liability for the environmental damages. Under pressure of the Obama administration, BP agreed to provide a twenty-billion-dollar fund to compensate businesses and residents for lost income and homes. But the total estimated costs, as of 2013, are approaching fifty billion dollars...a substantial amount of which we taxpayers will end up paying." Schapiro compares production and consumption and takes us on tourist visits to Pittsburgh, Pennsylvania; Guangzhou, China; and Manchester, England. Here we get to learn about green best practices, what to avoid as urban dwellers and how we might become more energy literate. There are surprises in these chapters. One of the most bizarre developments about carbon is how it is now a financial commodity that is traded on the stock exchange the same way as pork bellies. The last third of Carbon Shock is about the nitty-gritty of pricing carbon in which economists try to establish a price for a ton of carbon that will not be emitted. (That is not a typo.) Here the reader can learn the details about "cap and trade" and offsets. Mark Schapiro is an award-winning journalist, not only for his investigative skills but also for his ability to communicate. This very serious book on an extremely serious subject is laced with sentences that charm as well as inform. In describing oil in the ocean: "Satellite photos show the oil spreading from the Prestige like spindly black veins in the circulatory system of the Atlantic." While describing a rain forest in a flight over the Amazon jungle, he says the fields looked like "enormous green broccoli." He is his most lyrical when describing deforestation and this is why reading Carbon Shock makes me want to become one of the infamous tree huggers. "To see a rain forest cleared of trees is one of those scenes you never forget: stumps, tossed detritus, barrenness where there was once lush chaos." While flying over the Malaysian side of Borneo, he saw deforestation in which "the earth looked like an organism throbbing with the energy generated by photosynthesis with wounding gashes." And finally, Schapiro tells us that the average American automobile driver annually releases 25 pounds of CO2. But how does he communicate the size of this amount? One pound of carbon dioxide is the equivalent to the weight of a single cocker spaniel, according to his researcher, Sarah Terry-Cobo. "That's 557 cocker spaniels' worth of CO2 a year, from each of us with a driver's license," Schapiro says. After reading Carbon Shock, it's easy to give in to pessimism. I find myself wondering "how-on-earth" are we supposed to live in the face of such evidence? Certainly, we need new food ethics. And travel ethics. And irrigation ethics as water starts to be more precious than gold. And what about international politics? Melting ice caps, rising sea levels and mass migrations are national security risks. Nine African nations are considered to be at "extreme risk" of food shortages. A long-term drought in Iraq and Syria has forced close to one million farmers and herders from their lands, a key factor in the region's civil wars. Pakistan is described by the World Bank as one of the world's most stressed nations due to water shortages. And what about The Arctic? Will it become the next battleground of superpower conflict? The U.S., China and Russia are already vying for control of Artic ports. A pessimistic scenario? Maybe. But then, if you are young - say, under 45 - and skilled as well as environmentally conscious, maybe not. "A panoramic shift in thinking about energy is under way," Schapiro says. Good. We need a shift in thinking about energy. We need to create new financial decision making imperatives. We need to reshape geopolitical relations even if this means giving rise to new powers and diminishing others, including, yes, the United States of America. Chaos and uncertainty: These are the first two words of Carbon Shock. And this is what faces us, if we don't pay attention.